If you're a home-based business owner, freelancer or mobile worker, here are five reasons why you should try coworking in 2014. If your idea of a workspace is your kitchen table or a quiet spot in your local coffee shop, you should consider trying out a co-working space in the New Year. When you are trying to work out how to take your start-up business to the next level, using a co-working space should be on your list if you are a home-based business owner, freelancer or mobile worker. Offering the ultimate flexible working, co-working has gained in popularity throughout 2013 and it is set to grow even further in 2014. This year we began our own co-working initiative called The Work Lounge, opening the first space at Pixmore Business Centre in Letchworth. We are planning to roll out a national network of co-working spaces in 2014 with two new Work Lounges opening in January. 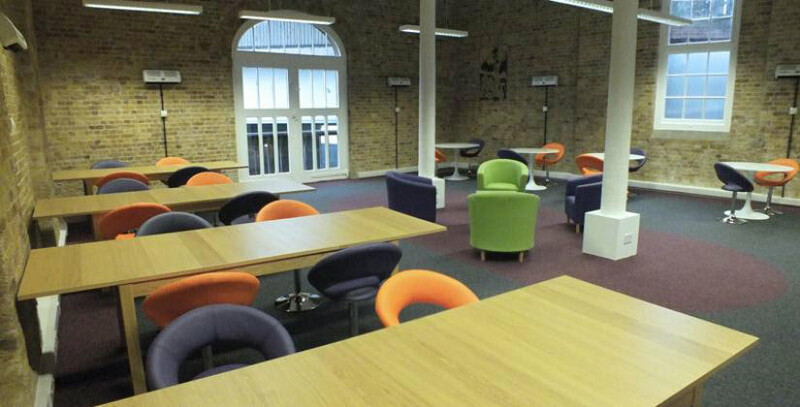 Our second Work Lounge will open at Brixton’s Shakespeare Business Centre on Thursday 16 January, with another opening at the Empress Business Centre in Manchester at the end of January. Working alone at home can make you feel lonely and demotivated. Getting out of the house and meeting people in the same situation as you can get you out of your rut. plus make some new contacts that could help your business. Not everyone wants to invite their customers into their home and arranging to meet at a coffee shop can seem unprofessional. By using a co-working space, you can feel confident seeing clients in a more business-like, but still relaxed setting. And if you need a more formal meeting, you can hire a meeting room within the same business centre. Co-working offers the ultimate in flexible working. You can work whenever you want and you only need to pay for the time you use. You don’t need to worry about trying to find a convenient space in a cafe or not being able to fit your work around your family’s routine at home. If you’re using a coffee shop to do your work in, the cost of all the drinks soon adds up. At our Work Lounges, the drinks are free and you also have use of kitchen facilities. We also offer free parking at most of our sites to help you keep your costs down. It is vital to be able to get online when you need it and a slow and unreliable connection can spell disaster for your business. You also need to know that your information is secure and that you won’t fall victim to cyber criminals. At our Work Lounge spaces, we include high speed broadband you can trust in the price you pay.